It’s safe to say that everybody enjoys pizza. That soft dough, crispy pepperoni, and oozing cheese. How can anyone resist the deliciousness that is pizza? Seriously, we should just make pizza that national food of the world. And the second best food in the world? Cake of course. Whether it’s chocolate, vanilla, or red velvet, there’s no way I’m passing on a piece of cake. Well the genius people at Pillsbury came up with the brilliant idea to combine to these two delectable foods to make the single greatest dish ever: pizza cake. Now while pizza cake isn’t really a cake, as it’s more salty and savoury than sweet, it’s still just as delicious as any cake out there. 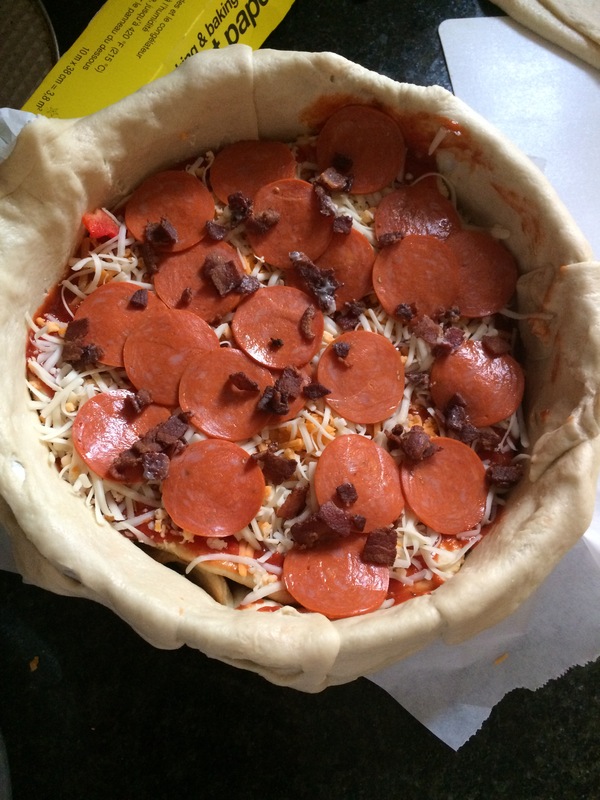 I’ve made pizza cake in the past and I must say it is a lot of work. But that being said it’s so worth it. 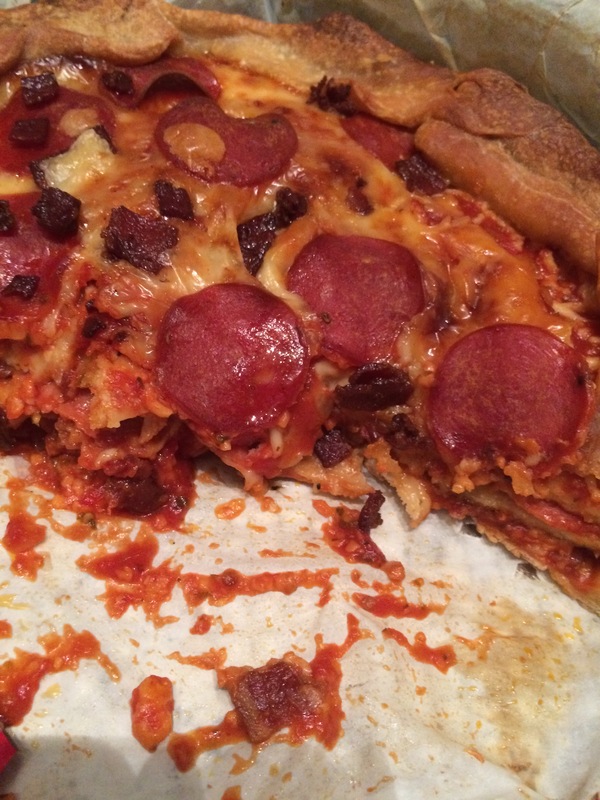 The pizza cake is essentially just pizza layered in a cake pan. The recipe may seem difficult but it’s actually pretty easy. However, I did have a few problems when I made my cake. The most difficult part of making the cake is rolling the dough to fit the pan. It’s best to use a springform pan that way it’ll be easier to take the pizza out when you’re done. The recipe says that you should use Pillsbury pizza dough. I’ve tried this recipe with both Pillsbury dough and without, and I must say I much prefer to use the non-can pizza dough that you have to roll out yourself. Don’t get me wrong Pillsbury makes delicious pizza dough, however I found that after I rolled out the dough from the can it wasn’t very big. I had to buy an extra can of dough to fit my springform pan. Also the dough is very tough and difficult to rework and roll to form the edges of the pan. I personally prefer to buy other dough and roll it out myself. You can just buy pizza dough from your grocery store; it works just fine. Aside from the pizza dough, there was nothing severely problematic about this recipe. 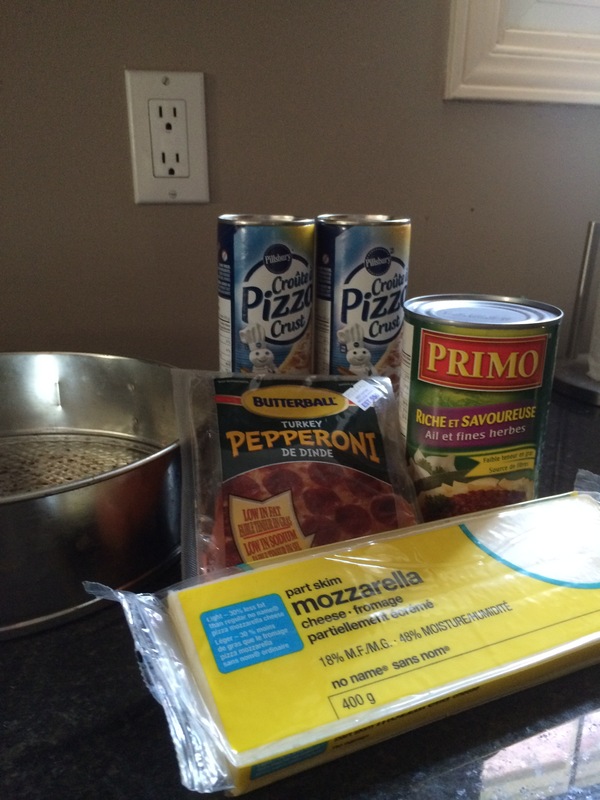 * you can use any of your favourite pizza toppings. Measure diameter of tall-sided ovenproof pan. (Pan used was 6-inch in diameter with 4-inch high side.) * I used a bigger pan and only made 3 layers. Unroll 1 can of dough onto work surface; press out into thin layer. Cut out 3 (6-inch) rounds; place on cookie sheet. Bake 8 minutes. Remove from cookie sheet to cooling rack; cool. 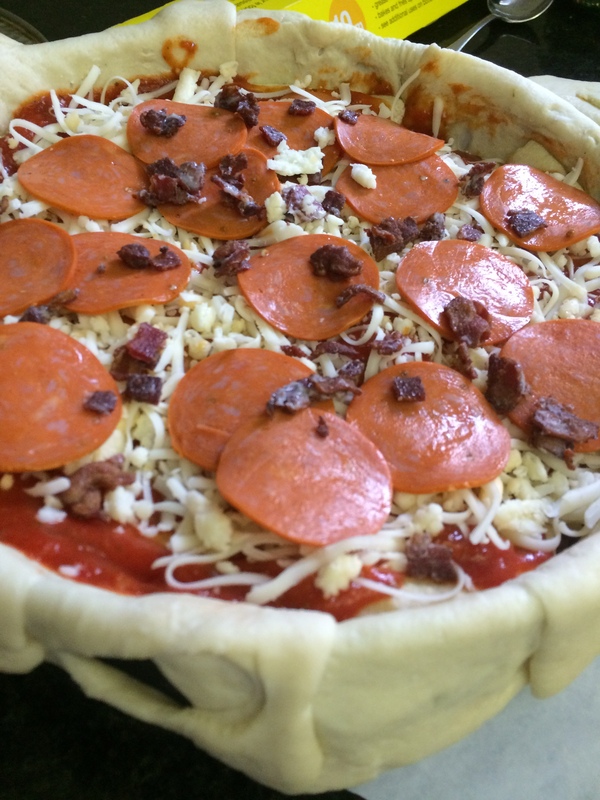 Bake 20 to 25 minutes or until dough around pizza cake is fully cooked. 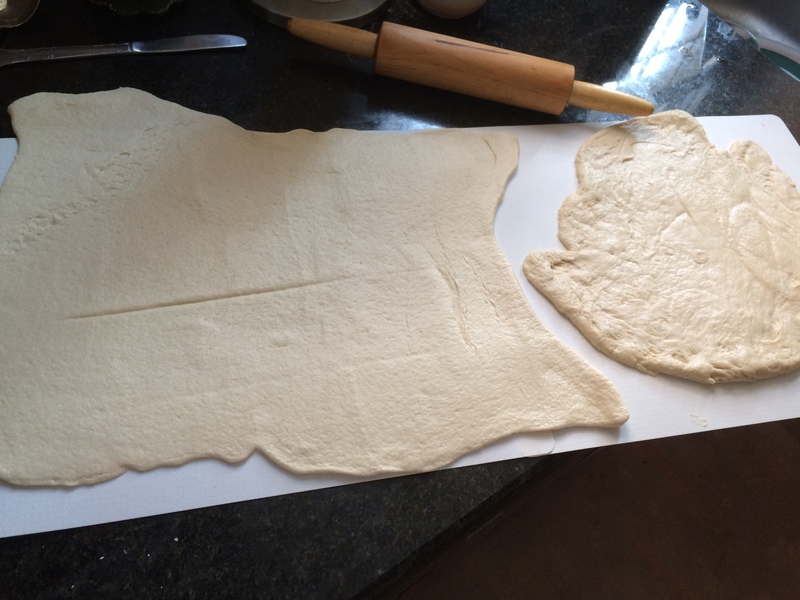 (To test, carefully pull up parchment paper to raise pizza cake out of pan.) Once completely baked, cool in pan 5 minutes. Remove pizza cake from pan; brush crust with butter. Use sharp knife to cut slices like you would a cake. *if you decide to use a different pizza dough, it may take longer to cook. Honestly, this is a must-try recipe for any pizza lover. It’s perfect for any pot luck BBQ, the “big game”, or just any given day. It’s pizza do you really need a reason to make it. Let me know how it goes, and share your comments and pictures.